From past styles to present beauties, homify 360° aims to bring you the best of what architecture and interior design has to offer. 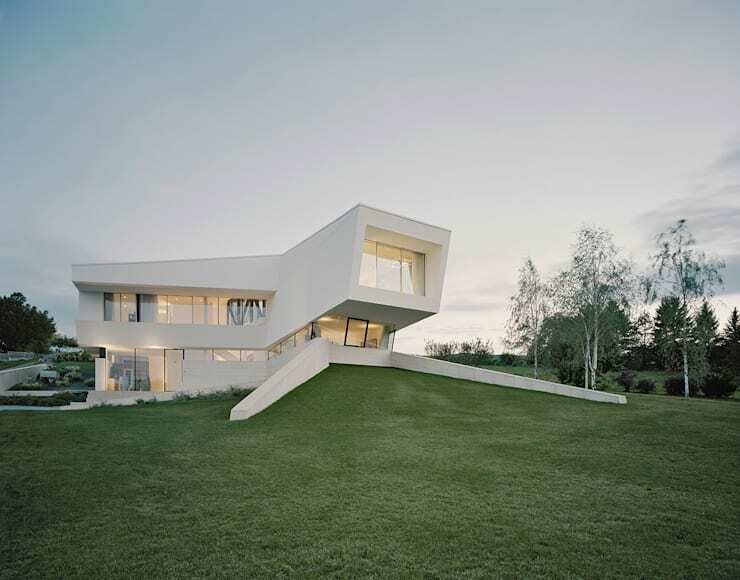 For today’s showcase, we take a giant leap forward to a house that is seemingly from the future, but is really located close to the Austrian capital of Vienna. From Project A01 Architects comes a snow-white villa with all the modern luxuries that one requires to live and enjoy a stylish lifestyle. Situated on a slope to ensure superb views, this luxurious residence doesn’t stand back when it comes to boasting about unconventional style. Modern design, spacious swimming pool, minimalist interior decor, huge spaces perfect for entertaining… could this be the ultimate dream home? Let’s discover and find out. Seen from afar, this villa is purely extraordinary. Shying away from the conventional structures, it presents its own exceptional vision of architectural value. Adding to its modern façade is the cantilevered roof. The design of this residence was implemented to provide changing views depending on the angle, yet it seems to present a stunning and beautiful vision regardless of where you find yourself. The villa consists of three parts: a basement which also doubles as a garage; a ground floor containing the living/dining/kitchen space, bedrooms, as well as a wine lounge; and a top level, which is where the 40 square metre spa and dressing room can be found. Perfect for the social event of the season (or lazy summer days when we want to daydream by ourselves) is the pool area. This space is adjacent to the open living room, separated only by a chic glass-glazed sliding door. This elongated pool is the perfect exterior element, either for practicing laps or floating on an inflatable lounger. And with this luxurious backdrop (we’re referring to the stunning house and that striking garden), any time spent here will be time spent fabulously. Whether you prefer them square-shaped or round, homify has some striking examples of pools in different shapes and a multitude of styles. 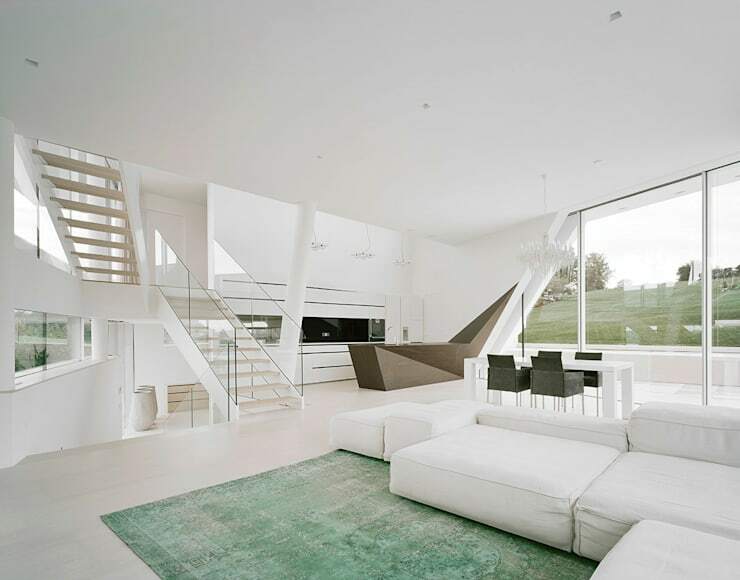 We enter the house and find the gigantic living area, which comprises the seating space, dining room, and kitchen. A fabulous mingling of whites and off-whites emphasise the high quality materials, resulting in a pristine and spacious room. A delicate green (is it mint or pistachio?) 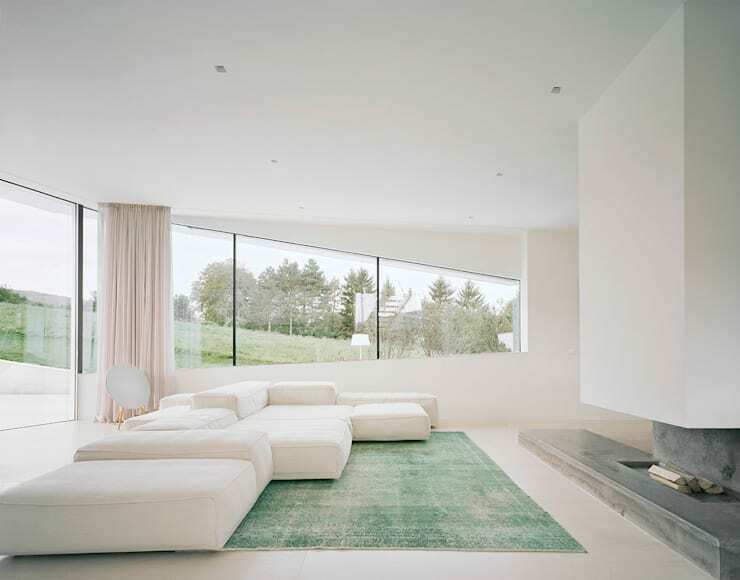 is injected by means of a lush carpet, highlighting that otherworldly sofa. And no need to worry about the dropping temperature: that open fireplace, cut out superbly from that concrete block, is ready to ensure a warm and snug evening with our glass of wine. This open floor-plan ensures a smooth flow between the different spaces, made so much more wonderful by the pale palette. Whether gossiping on that super sofa, sitting at the dining table, or keeping the cook company in the kitchen, no one will miss a beat of the conversation taking place. Along with the carpet, a handful of elements add some colour into the whiteness of the interiors: the dining chairs, staircase steps, and futuristic-looking kitchen island. Instead of the normal rectangular space used for cooking or preparing, this island sports a creative geometric design. Natural lighting flourishes everywhere, and we have that enormous exterior landscape that serves as spectacular wall art. So very often, a collection of whites tends to look clinical and boring. However, if done correctly, it can lend a spacious and luxurious look to a room. See the elegance that radiates from every corner and element here, thanks to the clever tones and ingenious arrangements of the furniture. And for those who think that stairs are merely meant for taking us from floor A to B, think again: these stylish steps fit in perfectly as part of the decor, making us almost afraid to walk on it for fear of ruining that pristine vision. We had fantastic views downstairs, so we certainly expect it to continue upstairs – and we’re not disappointed. Stepping into the elegant bathroom, we are immediately greeted by the gleaming rays of the natural light flooding in through the generous windows. 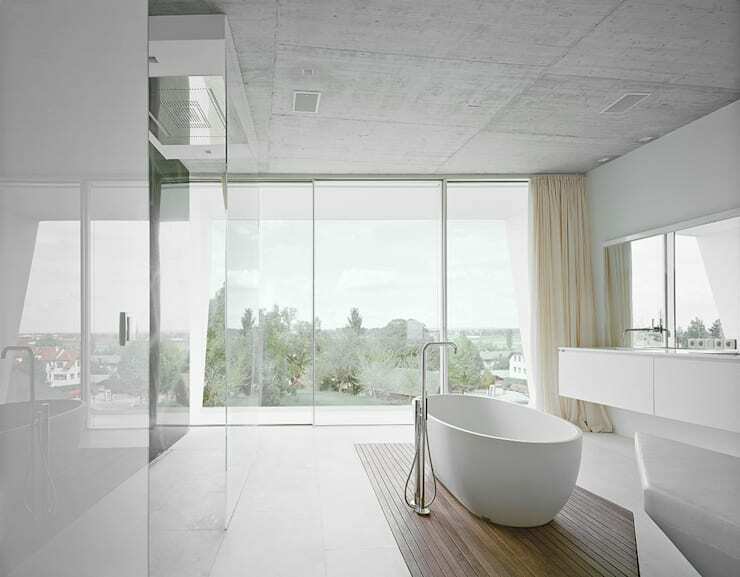 Thanks to the perfect combination of glass, white tile and pale concrete, it makes the room positively sparkle. The egg-shaped bath is the ultimate eye catcher in the room, standing proudly on a select wooden deck piece which marks off the bathing area. See our tips and tricks on how to: Boost Your Bathroom In An Afternoon. It would be a crime to end this tour without a glimpse of that stunning landscape. Green lawn, lush trees on the horizon, and an amazing sky serve as the fantastic view enjoyed by all in this stunning villa. Interestingly, the garden was designed in order to seem flowing seamlessly into the surrounding fields. 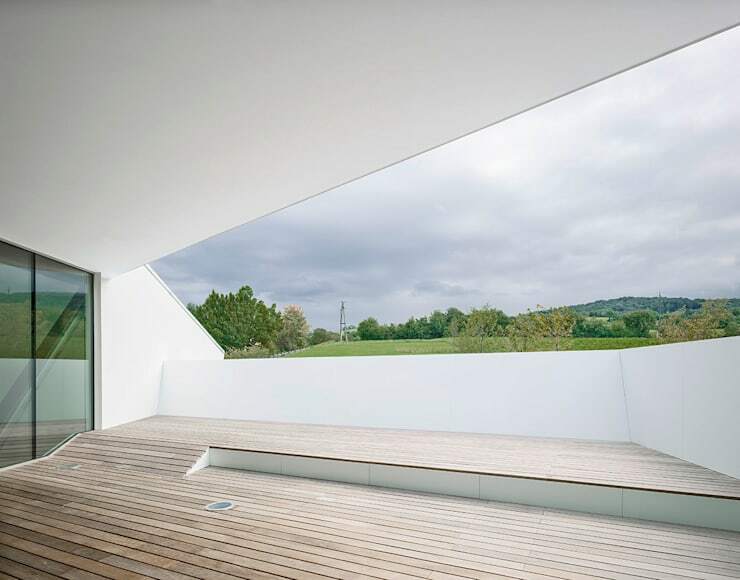 And because of the house’s location on a hill, standing on any terrace will give you an outstanding view of the Austrian landscape. The wooden deck floor of the terrace provides a prime space for anybody looking to entertain al fresco. Shall an outdoor grill look good here? How about just a lounger and side table for some private reading? Or it can be left as is – clear, open, and perfect.